Here is the other of the Christmas Cakes I made albeit this was my Husband’s request. 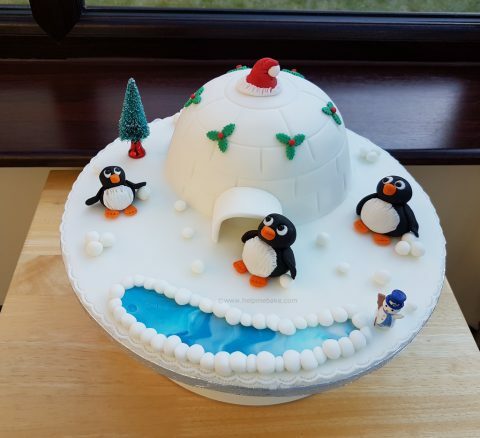 I turned the domed Christmas cake into an igloo, covered it in marzipan and then covered the igloo and board in white icing fondant. I made the penguins using white, black and orange icing fondant, added the snowman and tree for decorations and cut out the sprigs of holly using a cutter. I rolled the berries and snowballs myself using red icing and white icing. I then finished it off by making Santa’s hat for the top of the igloo. NextNextWhich sugar do I use when baking? Sugars and their uses.